You want to know about me? You sure? Almost 5 years ago, during the 2010 general election, I attended my first ever political hustings meeting. Held in Flitwick, Bedfordshire, the panellists were all parliamentary candidates for Mid Bedfordshire. The room was full and buzzing with many locals including myself attending in the hope of questioning the incumbent, Nadine Dorries, about recent rumours of a police investigation into her expenses claims. This was the first time I met Tim Ireland (@bloggerheads) and the last time I wore “normal” shoes. 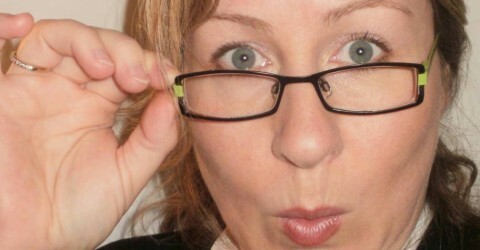 The meeting didn’t go as planned as the late-arrival, the incumbent Nadine Dorries, discovered the meeting was being filmed and broadcast by one of her more successful critics, Tim Ireland (with advance permission of the organisers of course, Tim is always extremely well prepared). For full context video of the now infamous event can be seen here. Fast forward five years, and I find myself at a second Mid Bedfordshire hustings event, this time being held in the pretty Bedfordshire village of Shefford (home of the Mid Bedfordshire Conservative Association office). The meeting was arranged and promoted by “Churches Together” and held in St Michaels Parish Church on the High Street. The candidates invited to attend were again-incumbent Nadine Dorries (Conservative), lovely Linda Jack (Liberal Democrats), gentle Gareth Ellis (Green Party), charming Nigel Wickens (UKIP), earnest Charlynne Pullen (Labour), delightful Ann Kelly (Monster Raving Loony Party) and an extremely brave and splendid chap who is now my partner, Tim Ireland (Independent). Yes, Tim Ireland. You heard me. Tim & I have been dating since April 2013 and living as a couple since August 2013 at our home in Harlington, Bedfordshire. During our 2 years together I have learned many things about Tim. I had first been drawn to him by his absolute integrity and attention to detail. (Yes he’s pretty, too, but that’s not what first attracted me. Much.) I have learned that he has a fabulous sense of humour, collects books (100s of them), can make ANYTHING out of bits of junk, and that he has been a victim of intense harassment for many years as a result of standing up for his beliefs. Indeed, I have witnessed it first-hand and had it directed at me as a result of our relationship. It is Tim’s desire for justice that has led him to stand for Parliament on an “anti-corruption platform” in his home constituency and frankly, it is a very appropriate choice of location. Tim’s campaign is unique. 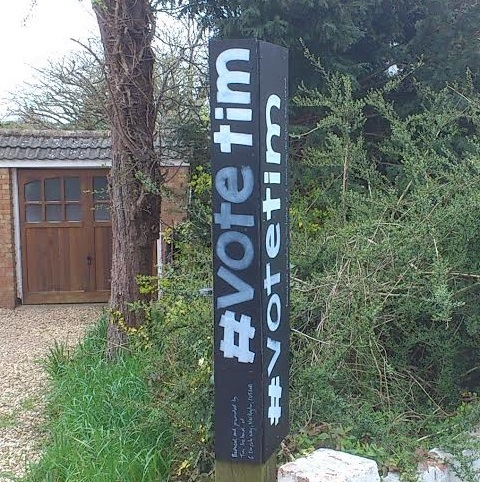 His hand-made posters carry the simple message “#votetim” and (as required by electoral law), an “imprint” – this wording reads “Produced and promoted by Tim Ireland of 6 Lincoln Way, Harlington”, and it satisfies a requirement of electoral law that all printed material carry the name and address of the printer and the promoter in order reveal who is responsible for the production of the material (PDF). His “battlebus” carries the same simple message plus a little bit of fun in the shape of an arrow pointing to the driver (Tim). Yes, there’s even an imprint on the car. Tim’s a stickler for detail. He doesn’t have the funds to compete with the high profile campaigns of Nigel and Nadine and so is using his creative talent and considerable ‘vote other’ appeal to reach out to his potential voters, but while the campaign may be ‘outside the box’, everything is within the rules. One wonders who the source of this ‘story’ was and what other falsehoods have been pitched to the newspaper in what can only be an attempt to harm voter confidence in Tim. Wednesday 15th April brought a further enquiry from a reporter working for The Independent on Sunday who was responding to a series of new and old allegations against Tim that had been pitched to them along with some local news outlets. The next day (16th April) upsetting articles along this line were published online by two local newspapers (without any offer of right of reply) and deleted by one them not long after for reasons unknown. Unsettled but determined, we chose to ignore the reporters for now and concentrated instead on preparing for the evening’s Shefford hustings. Where was I? Oh yes, the church slowly began to fill up with constituents of all ages, and the candidates mingled prior to taking their places on the panel. Before the meeting began, two young women (later identified as the younger daughters of Ms Dorries, Jennifer and Cassandra) and one young man (Ryan Austin, a former critic turned intern of Ms Dorries) began distributing leaflets and one of the young ladies delighted in handing one to me. I happily accepted the gift with a broad grin, but the contents stunned me. These home-printed leaflets carried no imprint (remember that annoying little election law thing?) and under the pretence of giving Nadine’s apologies for her absence, not only defamed Tim and myself but, I believe, sought to turn the audience against us both. The Chairman David Foskett swiftly asked for them to be destroyed or handed in as they were unauthorised. Naturally, some of them were retained as evidence. The hustings began with the Chairman introducing the candidates and explaining that Nadine would not be present. At this, the event almost immediately took on the air of a poor am-dram, even pantomime at times. People who other audience members described as “obviously planted objectors” took their turn disrupting the proceedings before storming out or being asked to leave. I am of the view that some of these objectors broke the law (yes, that pesky rules thing again). First up was an older lady who interrupted the Chairman’s introduction and demanded to know where Nadine was (despite being told twice already). She declared the event a “farce” before stomping off. As Linda Jack began her introduction, she was interrupted by the second in line, a very angry chap reading from a script (I won’t repeat what he alleged at this time). He was asked to leave and shouted down by the crowd who had already had enough of the disturbances. Finally the meeting was allowed to begin, and we were back to Linda (who handled the disturbance with her typical humour) followed by Tim (who introduced himself by reading a bible passage about evangelism and intimidation and declared that he would not hide his light under a bushel for ANYBODY!). The moment Tim had finished speaking, another ‘plant’ began declaring that Nadine was “prevented from coming” before storming off. Barely seconds passed before yet another ‘plant’ asked why Nadine wasn’t there (despite his already knowing before being told several times). He mentioned the leaflet and started shouting down the Chairman who was repeating their position on not taking questions from the floor and asking the man to sit down or leave. The man loudly concluded that it was a “complete and utter waste of time” before being escorted out. Each of these events were met with an isolated ‘hear hear’ and anaemic applause, both of which came from Dorries’ own children, who tried and failed to spark dissent in a room full of people who were already sick of their shenanigans. There was an appropriately-submitted question on defence next, which was answered with passion by Linda (an ex-servicewoman) and Tim who movingly informed the audience of the lack of after-care interpreters in the Iraq conflict had received from our government at the time. Then, yes you’ve guessed it, another one. This one asked how “YOU” (Tim) could dare to stand “in the House of God”, read the bible, and talk about justice. Well, forgive me if I’m wrong but a church seems to me to be the perfect place for such an activity, and in any case it was Tim’s own bible and his right (and his turn!) to speak about justice or anything else. That man left with his partner before he could be escorted out, and peace ensued for about 20 minutes. The uncomfortable wooden pews were beginning to cause people to stir a little in their seats and a few people left quietly when we were approaching the hour mark, but the audience was still approximately 100+ strong when the last disturbance began. A female voice this time, one of Nadine’s daughters loudly announced that “Nadine would like to be here, BUT”. She and her sister proceeded to point accusing fingers at Tim, each making false allegations against both of us (again, we have concerns about the law here, but Tim’s immediate reaction was sadness that Nadine had apparently involved her children so deeply in the matter). Both girls singled Tim out and accused him of being a stalker during this final disruption. I had a brief moment of déjà-vu at this point, remembering the Flitwick hustings. Notably, by this time the audience had absolutely had enough and the two girls were booed out of the church. With still over 100 audience members present, the hustings continued without further interruption and the debate finished at 9.50, followed by a chance to chat with the candidates or leg-it home to catch up on the other political debate of the evening (you know… the one that Cameron & Clegg chickened out of). We are mindful of the law and don’t wish to fall on the wrong side of it ourselves, but with no newspaper covering the event and a lot of chatter going on, we thought it important that a detailed record of the event exist. There is a lot of talk about what did and didn’t happen at the Shefford hustings and we wish to protect the wider public from potentially finding themselves in difficulty by innocently speculating on what actually happened, or perhaps repeating some of the reports of the event tweeted by Nadine Dorries and parties who were directly involved in the disruption. It is safe to say that these reports are far from accurate. You may arrive at conclusions about where this event leaves some people with regards to the law, but you are urged to not make any declaration about any of that, particularly about any of the candidates involved. This post is designed to inform the public about the events as they unfolded, and we ask you to handle the information delicately and appropriately. Bedfordshire on Sunday, if you’re reading this: THIS is your story, and it’s a real one this time… with physical evidence and hundreds of witnesses. With this in mind, I suggest you do your job and finally report on it. And if you have time, Tim is still waiting for that retraction and apology. Pretty please. I can confirm that there is a police investigation into these events in progress and we look forward to a conclusion in the not too distant future. The inquiry by Bedfordshire police into the events at Shefford resulted in a file being passed to the CPS who concluded that there was insufficient evidence to proceed with a case. The Sunday Mirror covered this story today. 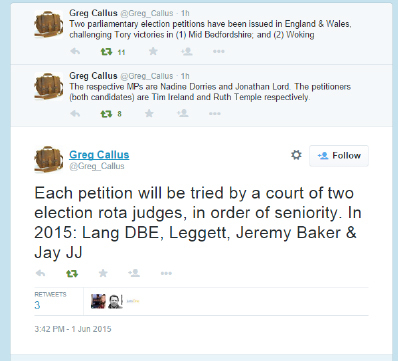 I can now confirm that a parliamentary election petition has been lodged by Tim against Nadine Dorries. More information about petitioning the result of a general election is available here: Electoral Commission . UKIPping me? Facts not fear! 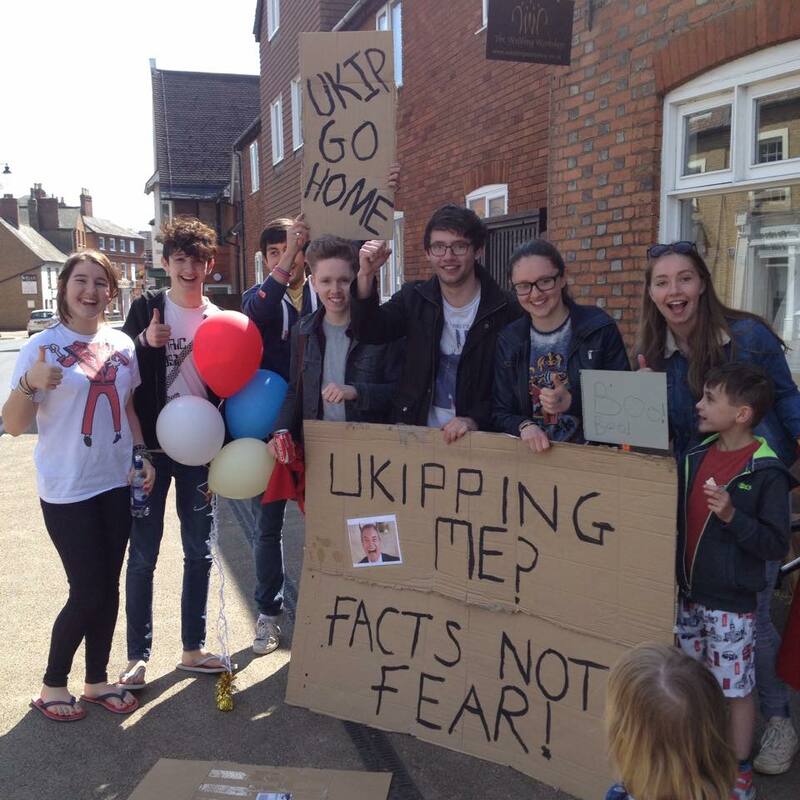 Many adults in Mid Beds may be taken in by the UKIP party lines but not it seems, the youth. The picturesque village of Ampthill were *lucky* enough to play host to UKIP PPC Nigel Wickens yesterday. Mr Wickens, who I recently met, is a very charismatic and eloquent man so naturally I’m scared stiff he’ll pick up a lot of votes here in Mid Beds. Therefore, I was very relieved to see this lively, youth demonstration in my Facebook feed this morning. Setting themselves up in opposition to Nigel on the other side of town, the kids are reported to have had fun, been polite and got their message across. They even had a wave at Conservative PPC Nadine Dorries who drove by in her self-titled “Nad-Mobile”. An eye-witness and local shop owner said “ukip were one side of town the kids were the other.. the heckling ukip were getting by members of the passing public was hilarious…. the kids were very very grown up and just did their bit but didn’t heckle”. Tomorrow is the last day you can register to vote. PLEASE use your voice, even if like us you live in what is considered a “safe seat”. The 2010 election saw over 21,000 registered Mid Beds voters fail to use their voice. What a difference they could have made if only they felt their vote mattered. Don’t believe the propaganda, there really is no such thing as a safe seat! Now the run-up to the 2015 general election is hotting up, I keep seeing digs on Twitter about “Lefties” so I started thinking, what exactly is a Leftie? In the “old days” of course, a Leftie was a person who is left-handed. There is even an annual Left Handers Day on 13th August to celebrate being one of the special 10% . On Twitter however it is used to describe/deride those who hang to the left. Politically of course. A quick search show this particularly nasty example of how one tweeter sees “Lefties”. So what makes a Leftie a Leftie and why would that be a bad thing? In my experience a Lefties are kind, generous, will fight for the vulnerable, join together to make positive changes and are an all round “good eggs”. So why are we seen by “the right” as a bad thing? 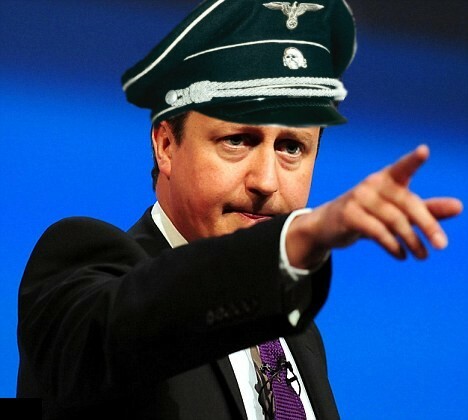 Surely Lefties are exactly what David Cameron wanted for his “Big Society” push? The volunteers, selflessly giving up their spare time and very often their money to keep community organisations and charities going following government cuts to their funding? Why do “the right” find us so threatening and seek to undermine us at every opportunity? It seems to me that being brought up in privileged worlds where they have never had to “make-do”, scrimp, save or fight just to have an equal chance makes it simply impossible to comprehend that people really can be and are this good. Interesting article about the decline in Conservative party membership numbers since David Cameron came to power. Another showing that UKIP membership raised more money last year than membership of the Conservatives. 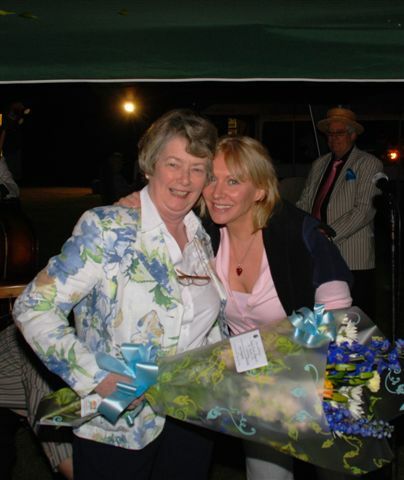 Poor old Nadine Dorries MP is in the doo-doo again, she seems to have forgotten who her friends are. Yesterday’s Sunday Mirror exposed a bizarre triangle between Nadine, her “landlord” (and previous local party chairman), the millionaire Andy Rayment and one Romanian “Ramona Ladin”, a mobile hairdresser who it transpires may not just offer blow-dries. 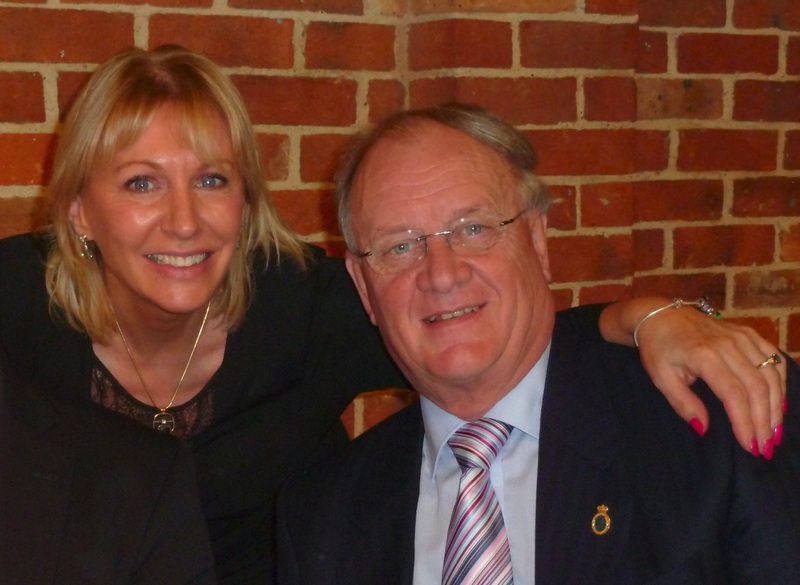 I thought I would help Nadine out by refreshing her memory.. Andy & Ann Rayment have been your friends for many years, as far back as 2009 the Rayments held a party for you at their home in Westoning, inviting 125 guests. Much fun was had by all and the photos were proudly posted to your blog for all to see. You also invited the Rayments to a “Dinner with Davis” in 2011 where this charming photo was taken of you two BFFs. I’m sure you will be *so* happy to be reminded of this wonderful photo, you may even like print and frame it. They also “rent” you their specially purchased large detached house in Westoning, the one that your dog & daughter reside in, you remember the place surely? You moved in just after your relationship with another best friend’s millionaire husband went belly-up. Andy was also your local party Chairman for several years, he supported you 100% through your many expenses scrapes and – some would say, “saved your bacon” with the local party on more than one occasion. He also ignored pleas for help from one of your victims critics on your behalf, so he is clearly a good and loyal friend. Let’s do a quick comparison shall we? Alistair is a MINISTER, Nadine a back bencher. Alistair has a fantastic team of assistants who cover his constituency in his absence. Nadine employs her daughter Phillippa on a generous, tax-payer funded salary to run her office, despite the fact that Phillippa actually works full-time as a trainee lawyer for Mischon De Reya. They both claimed just over £158,000 in parliamentary expenses 2008/9 , Dorries as a back bencher, Burt as Assistant Chief Whip and Deputy Chairman of the Conservative Party with responsibility for Internal Development. Alistair is a Burt, Nadine Dorries is a Berk. Time to practice what you preach Mr C? 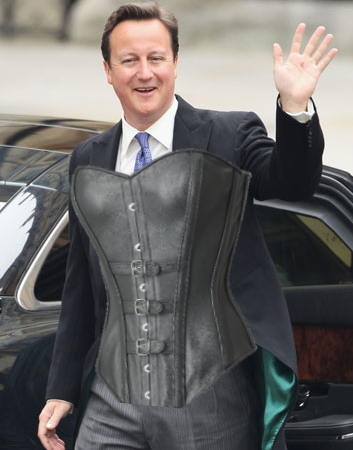 Downing Street later said the government had no plans to introduce quotas and wanted the impetus to come from business….